The Reception Room is 99 square metres and can accommodate up to 60 people for a sit-down dinner and up to 100 in cocktail mode. Overlooking Anzac Parade and the University of New South Wales, the room has floor-to-ceiling windows that can be curtained off for audio-visual presentations. 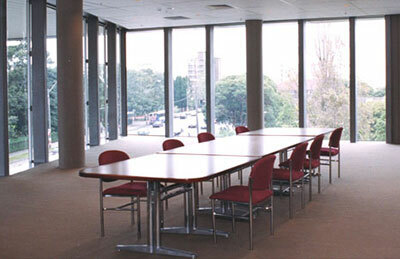 The NIDA Theatres Reception Room is located at NIDA on Anzac Parade in Kensington, Sydney. The NIDA Theatres Reception Room can be curtained off for audio-visual presentations and comes with a whiteboard, a 55” flat screen television with internet and computer connectivity, 25 chairs, 4 tables and a CD stereo system.